Last Wednesday, the municipal police have evicted the A Insumisa social centre in Galician city A Coruña. The space originally belonged to the Ministry of Defense until, after more than 15 years of abandonment, it was ceded to the city council. In November 2016, it was reclaimed by residents of A Coruña and since then it has been carrying out a range of social and cultural activities organized through open assemblies. After it was occupied and set up as a social centre, the city council came up with their own proposal to turn the space to a cultural project similar to the one already set up by the citizens: except that it was to be managed by the council. The council’s proposal was rejected by the local residents and participants of A Insumisa, who defended the local self-managed project that already worked well without the intervention of the town hall and without public funding. After this defeat, the city council initiated the eviction process, which was finalised last Wednesday. 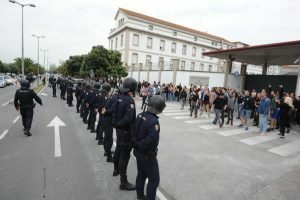 On Wednesday morning, fifteen hours after the deadline for the eviction, the local police turned up at the door, and were met with locals gathered outside to defend the space. During the eviction there have been police charges that have resulted in several people being injured, some with blows to the head. The police also used tear gas. Two women climbed the roof of the Insumisa and resisted police attempts to take them down while the solidarity gathering remained at the doors. Despite repeated requests from the demonstrators, the police didn’t allow water and food to be given to the women on the roof until late afternoon of the very hot and sunny day. The tense situation eventually resulted in the police charge at the solidarity gathering. Finally, at 11pm, it was agreed that the two women will be allowed to leave without arrest or giving away their personal details. The experience was the biggest carnage in our city in decades. The local police did not hesitate to use truncheons, iron bars (no, I’m not exaggerating, look at the extendable truncheons used, they are iron bars typical of real psychopaths), for the first time I remember the gas was used. The food and drink delivery to the two women on the roof was prevented with the sole intention of giving them a sunstroke. Journalists present were intimidated, the police even noted the license plates of the cars who and dizzy on the roof, took the license plates of the cars which expressed solidarity with the gathering by honking their horns. Some people were injured. Following the eviction, the squatters called for a protest in A Coruña today afternoon.